Does doing good do any good? We know the world isn’t flat, but spiky. Whether we can do things about those spikes drives U.S. domestic political debates. Do we want a society tilted towards conserving resources for those who already have them, or are we stronger if we shift resources towards liberating people from circumstances they didn’t create, but weigh them down? Can we smooth the frictions created by things like where we’re born and in what circumstances? At its core, US domestic politics is about whether helping others really helps. One of the most difficult questions in this fundamental debate involves whether spreading resources can be made to work broadly. We know that it betters our society as a whole to pool resources for public education. Even though public education is terribly uneven, ensuring the vast majority of Americans can read, write and do math is good for our overall society. We know it betters our society to share resources to make sure there is clean water. Clean water improves everyone’s health and life expectancy, creating a more stable society. But what about sharing resources to actually lift people out of poverty? Farah Stockman, the talented Boston Globe columnist who is also a friend, volunteered years ago in a summer camp for kids from public housing. She went back two decades later to see whether the camp she worked in had made a difference. What she found in this series of six articles was complicated. The ones who made it out seem so focused and disciplined that they might have done it anyway, though it’s clear that they benefited from the networking opportunity found in a camp that connected them with outstanding Harvard undergraduates. The ones who don’t get out show how our public policy system actually can encourage single motherhood, even for people with talent and some drive.One intriguing individual seems to succeed in her own way, but she avoids Stockman and so we’re not really sure what worked. I hope Farah’s well-deserved Pulliam Fellowship means she can continue to explore the questions she raises in this excellent series. Don’t have time to read all six pieces? The New York Times summarized them here. Oh, right. I’m an award winning journalist, even. To help me remember that, I won another: Outstanding Business and Technology Article from the American Society of Journalists and Authors. I won for a piece on Warner Music Group and its effort to forge a future in the digital world, Take Us to the River. It ran in Fast Company in July of last year and was the last feature I wrote before the Nieman year started. Kudos also to my friends Barry Yeoman and Jonathan Green. Barry won the Arlene Eisenberg Award for Writing that Makes a Difference, for School of Hard Knocks, his piece on the malign nature of some for-profit colleges. 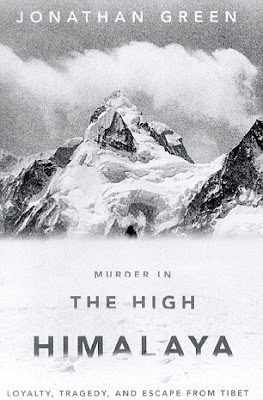 Jon’s book Murder in the High Himalaya won for General Non-fiction. Modest, self-effacing and dead-on with his approach to media. That’s Adam Penenberg, who is now getting buzz for using Twitter to break a story, prompting mainstream media to pick up on it. Here’s a good run-down of why it matters, including an interview with Adam. Adam, glad to know ya! My blog posts have become irregular, as I focus more on Twitter and its instant publishing (I’m a bad systems admin or I’d just add the Twitter feed to this blog). But Ennyman, Ed Newman’s catchy online moniker, keeps posting away, and now has become a source of interest for other bloggers. Two interviewed him just this week. One, Who is Ennyman?, looks at his eclectic interests, especially his voluminous consumption of books. The other, The Many Faces of Ennyman, focuses on his art. “Compulsively readable” was what the Boston Globe had to say about Shankar Vedantam’s new book, “The Hidden Brain.” I met Shankar via the Templeton-Cambridge Journalism Fellowships, and I’m not surprised. All of us who know him admire his work ethic, his clearheadedness and his extraordinary ability to make obscure things make sense. I’m looking forward to reading the book — and hoping he’ll give a reading while he’s here. Amy Green weighs in on the dilemma of Demand Studios, which advertises via SPJ to find writers, but pays what looks to be far less than a living wage. Still, Demand has extraordinary success getting copy. (Disclosure: I am vice-chair of the SPJ’s freelance committee, which Amy chairs, and was one of the people who read Amy’s post beforehand and made suggestions.) It baffles anyone who tries to make a living at writing why people would work for wages that wouldn’t keep a kid in candy (well, diapers, anyway). Hey, you can make $15 for an article? Nobody but a blockhead would write for that, as Samuel Johnson might have said. In truth, writers probably would make more from Demand than as playwrights. People strive to write plays, to write poetry, to write novels and non-fiction books of all sorts, almost none of which pay the bills. I don’t disagree with Amy’s column. Demand could wreak havoc on the market for writers of service journalism, and I would probably quit writing rather than write for Demand’s wages. But I find it hard to get angry about the company. I don’t think it abuses people. It pays something to everyone who writes for it, which is more than Huffington Post can say. I didn’t get mad about Elance and other exchanges that gutted the price for certain kinds of programming gigs. I even wrote a mildly fascinated piece about Amazon.com’s Mechanical Turk, which contracts out work that often pays in pennies. You might think nobody in the U.S. would do this work, but in fact they do. Demand is a symptom of something, not a cause of it. That something looks like the demise of writing’s version of shoeing horses, run-of-the-mill, everyday how-to writing. It might also eliminate higher-end service journalism, but that remains to be seen.